This is a few days later than I had originally hoped for. I apologize for the delay, but I’ll try to make this worth the wait. The other day I published the September Detached Market Report. The report basically highlights another slow month for Vancouver real estate. Sales were down from August and inventory was up. Sales to actives ratio continues to take a beating. But enough about the detached market, how is the condo/townhouse market doing? In August it appeared things were stabilizing and returning to historical levels. So where are they after September? Full breakdown below. Sales dropped in all areas from a slow August month. Not by much, but they did drop. Sales dropped from August to September, Vancouver East 2%, Vancouver West 4%, Richmond 29%, Burnaby 9%, REBGV (Metro Vancouver) 9%. Metro Vancouver Condo Sales drop 9% from August. Compared to August townhouse sales were down 18% in Vancouver West, 10% in Richmond, 24% in Burnaby, 13% in REBGV (Metro Vancouver). Townhouse sales were up 10% in East Vancouver. Because there are so few townhouse sales each month changes can fluctuate quite drastically. A more conservative approach is to look at Metro Vancouver to understand the trend. Metro Vancouver townhouse sales drop 13% in September. Inventory was up and down depending on each area in September. 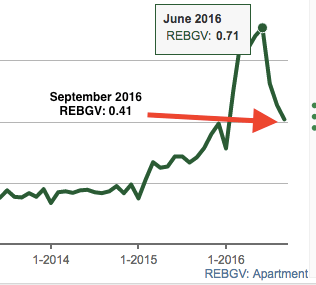 REBGV(Metro Vancouver) inventory was up 7.5%, Vancouver East up 12%, Vancouver West up 14%. Richmond down 13%, Burnaby down 18%. So what to make of this? Metro Vancouver gives us the biggest set of numbers again, so probably best to look at inventory being slightly up at 7.5%. However, if you want to be more conservative you can basically it a wash.
New townhouse listings remained pretty flat. I’ll stress this point again, because the sample set is so small it can fluctuate drastically month to month so it should be taken with a grain of salt. Vancouver East up 17%, Vancouver West up 25%, Richmond down 17%, Burnaby down 7%. 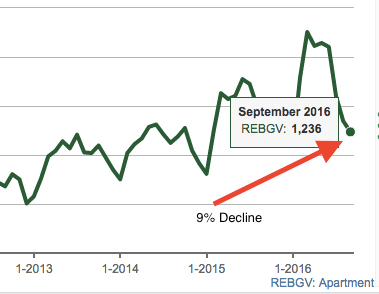 REBGV (metro Vancouver) up 3%. Anything over 20% is a sellers market. So obviously we are still in a strong sellers market for condos. However, what’s important to note is that the sales to actives ratio has declined every month since June. For example the sales/actives ratio in June for Metro Vancouver was 71% in June and now sits at 41%. As per the numbers, the townhouse market still favours the sellers. 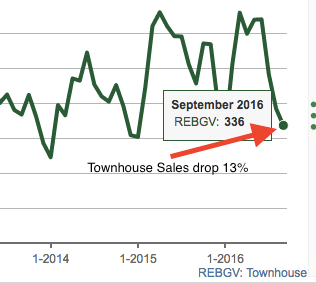 The same trend for a plummeting sales/actives ratio can be seen for townhouses. So although we are still in a sellers market, the ratio is well on it’s way to favouring the buyer if this trend continues. Metro Vancouver sales to actives ratio has plummeted from 72% in June to 34% in September. Inventory remains low in the condo market. So although sales have been plummeting, sales need to continue slowing or an influx of inventory will be needed to continue the shift towards a buyers market. Just like the sales/actives ratio, you can see the townhouse market is getting awfully close to a balanced market. In Burnaby there is already 4.3 months of inventory which would be considered a balanced market. Everybody keeps saying prices haven’t changed. Even with detached. Which we know isn’t true- as per my post What is happening to sales prices in Vancouver? Average & Median price graphs show detached prices are down 16% since January. So what about condos/townhouses? There’s no real trend at this point, just a lot of ups and downs each month so it’s incredibly hard to determine. For condos and townhouses it appears to be a stabilization since May. The condo and townhouse market remains a sellers market. However, the market has been slowing. This is apparent from the plummeting sales to actives ratio, and fewer and fewer sales. However, inventory remains low and is well below historical averages. It will take a continuation of fewer sales each month or an influx of inventory to shift it from a sellers market to a buyers market. At the current rate expect townhouses to hit a balanced market across Metro Vancouver within 2 months.